It was only a week ago, but I'm dying to know if I passed the exam for an endorsement on my teacher license. I know that if I don't, I will receive feedback on areas that need improvement, I'll practice more, and take the exam again. But it doesn't make the wait any easier. Our students go through these feelings, too, and I often wonder if I'm better at processing them because I didn't have to grow up in an education system that promoted high-stakes testing. I'll never know, for sure, so I use this concern to inform the way I design assessments. With all the great new ways we can manage information, one of my favorite concepts is automation. I automate emails, text messages with Remind, posts to Twitter, Google Classroom posts, and much more. 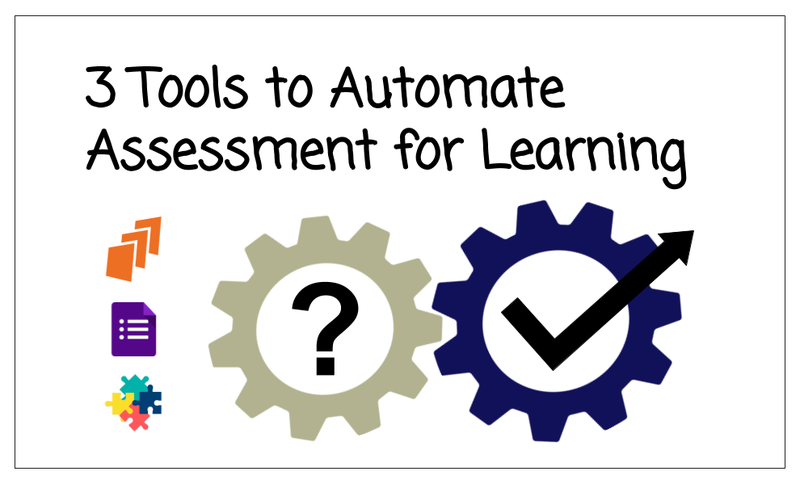 Why not automate assessment grading? Timely feedback is the keystone to formative assessment. Students need to know, in the moment, whether or not what they are thinking and doing will work in the long run. I can't take away all of the stress of testing, but perhaps the little formative tasks along the way don't have to contribute. Here are a few of the ways I've been using automation to address the issue of timely feedback. A docent is a guide or a person with the right to teach. DocentEDU made a wonderfully simple tool to do just that. I use Docent for guided reading. It's quick to set up, and there are a variety of question types. The image below shows a multiple-choice question. What's nice about the multiple choice question is the automation. Each question is scored automatically, reducing the points on each try. I like the reduction in points because it adds a gaming element. Plus, I don't put these grades in the gradebook to calculate summary grades for report cards because they're formative. I want my students to reflect on their strengths and weaknesses, not stress about them. This is assessment for learning. The second image shows the scoring by question for each student. Teachers can see the class average and download a CSV file for data collection. A low class average tells me either that the students didn't do well or a handful didn't do it at all. Either way, the conversations are based on data collected automatically. 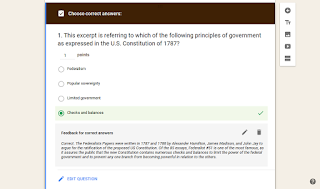 Before the quiz mode on Google Forms was available, I used Flubaroo. 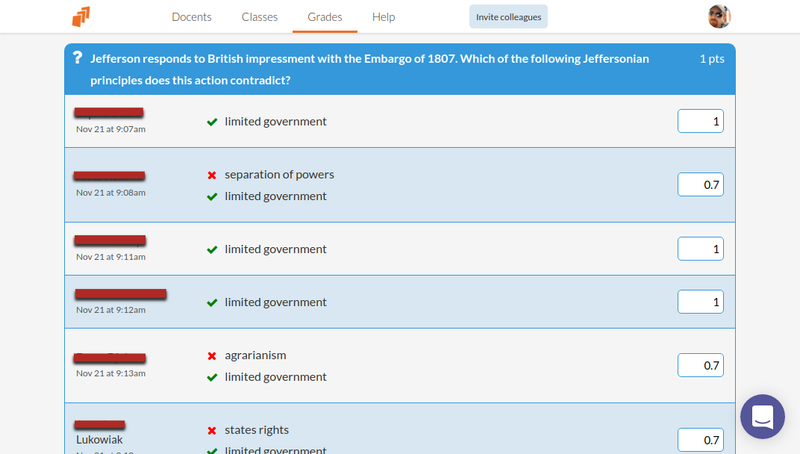 The new quiz mode will autograde assessments. More importantly, automated feedback can be left for correct and incorrect responses, a feature that allows me to use this tool in the assessment for learning context. When we allow learners to take risks and receive timely actionable feedback, they don't need to wonder how they did. They can spend time thinking about how they got there and how to succeed next time. Like the story I shared about myself, it's hard not knowing. It can take something away from us, and I'm not willing to do that to the kids in my high school history classes when we have the tools to do otherwise. This is another one of my new favorite tools. It autogrades, provides several question types, and adds opportunities to think critically while watching short videos. 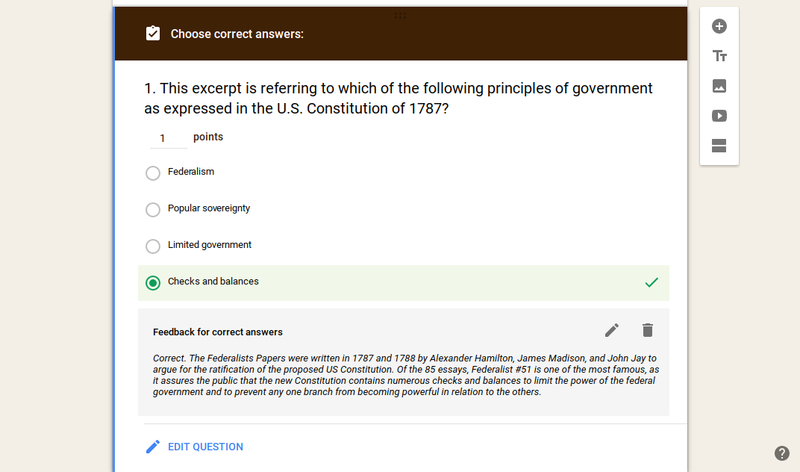 Like the Google Form quiz mode, the responses can include feedback for answer choices. 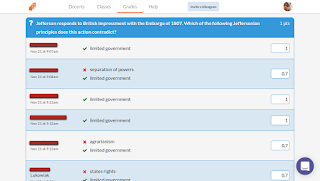 What's more, EDpuzzle allows teacher users to provide specific feedback for each answer choice. Google Forms only provides for feedback to correspond to correct and incorrect answer choices. One of the additional points of data that EDpuzzle collects is the watch behaviors. For example, if I notice that a student got a question wrong, I can compare that to the watch behavior, which shows how much video was rewound in particular spots. When this information is compared to the response results, we can talk to students about how they are processing the information in the video to respond to the question. In other words, I can see whether or not a student is struggling or just going through the motions. Just because kids watch YouTube, doesn't mean they are skilled at comprehending the content. 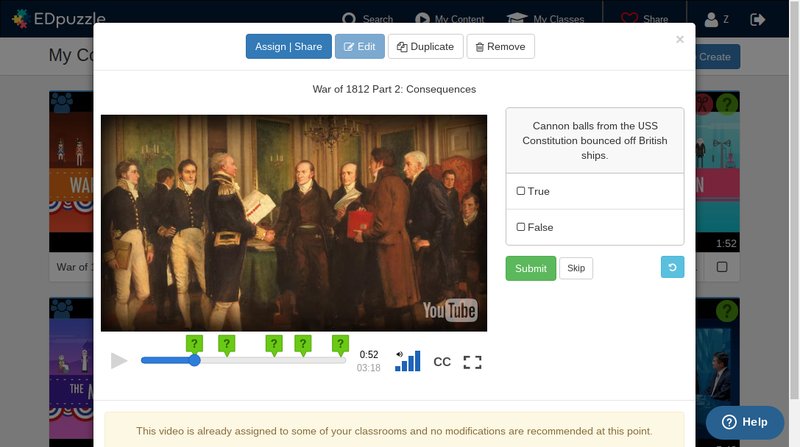 EDpuzzle is a game changer for educators who recognize this 21st century learning issue. We do a lot of formative assessment in my classes. It's the only way you'll every know if what your students are doing will help them achieve the learning objectives. By automating some of these assessments, it frees me to focus on providing feedback on writing, which is where learners are more likely to be engaged. I also believe that automation needs to be leveraged the more we use digital tools for learning and assessment. We don't have the tactile memory of carrying the papers back and forth to school or the visual of stacks of folders on the desk (many still do, of course). Google Keep has been one of the ways I remind myself to check writing assignments and to take a peak into the virtual classroom that's always ready and working, like the world that's being reinvented as we speak. Here are some related posts on the tools mentioned above. It's not often that I walk away from a faculty meeting inspired by the way it was conducted. Although my principal always tries to model classroom expectations in her meetings, this time she nailed it. The content, questioning, discussion probes, and use of technology were all meeting and exceeding my expectations. In particular, I was delighted with the way she used a tool called Mentimeter. She used it for word cloud generation and open response during the debrief of a great TED talk, "The Danger of a Single Story." As I sat and participated in the discussion, it got me thinking about the ridiculous amount of digital tools available to us in 2016. There are so many tools to facilitate individual responses and visualize thinking. Mentimeter was a great choice for my principal, and she explained why she chose it over other tools. For teachers who don't know their options, however, choosing tools can be more troublesome than they've yet to realize. It's hard to find one tool that does it all. More often than not, I find myself asking if I really need to use anything beyond Google Apps. On the occasion that a Google App doesn't facilitate a strategy, the search is on. The main idea to focus on is the reason for the tool, not the tool itself. Designing lessons, in other words, is about considering tools that could add efficiency or support a particular strategy. After going through this process for several years, I've realized that my allegiances are to the tasks, learning process, and outcomes more so than particular tools. I feel it's necessary to make this statement about my process because the echoes of the single stories about me and my interests in technology have frustrated me for years. Luckily, I've found enough people who do understand my intent, so here's a few of my uses and rationales for a handful of tools – always a work in progress. My first encounter with word clouds was in 2010 when a teacher gave me the idea to use Wordle to represent the academic integrity policy that my students made. To this day, you'll hear people refer to a word cloud as a Wordle. No big deal. Frisbee and Dumpster are brand names that we use generically all the same. Word clouds arrange common words or submissions by making the most frequent words larger than the others. They are great for prioritizing vocabulary studies or, as in the way my principal used it, making the thoughts of a group visible to create a general reflection of the room. At the meeting, we watched a TED talk and submitted the first three words that came to mind after reflecting silently for a moment. The tool my principal chose worked perfectly on all devices and with no account required. She liked it because there was no limit to how many responses each question could receive, and it was free. My word cloud generator of choice is Poll Everywhere. 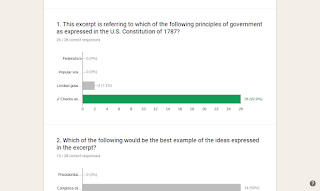 I continue to choose this tool after using it for four years because it integrates with Google Slides, the app allows me to push questions to students while I walk around the room, and Poll Everywhere has a variety of types of question response options and presentation formats. I could go on and on, but this post is not about the tools. Students can submit the words that are not sticking, and our discussion on terminology can be based entirely on student data. With the more troublesome words appearing larger than the others, we make the most of our learning time, and, most importantly, the priorities come from the students. By design, the word cloud strategy is a lesson in itself because it teaches kids to prioritize and use technology to access and analyze information efficiently for the benefit of the group. Keeping with the theme of guiding lessons through student contributions, the open response is another power strategy with many tools ready to facilitate the process. Open response, as a strategy, comes in many shapes and sizes. That's why I have a long list of tools to accommodate different types of open response activities. Today's Meet is a chat room with a character limit – 140. We use it for silent Q&A during readings, sharing current events for homework, and simple back channel discussion. Google Forms is the tool I use most often, especially since it doesn't require you to access the response sheet anymore. 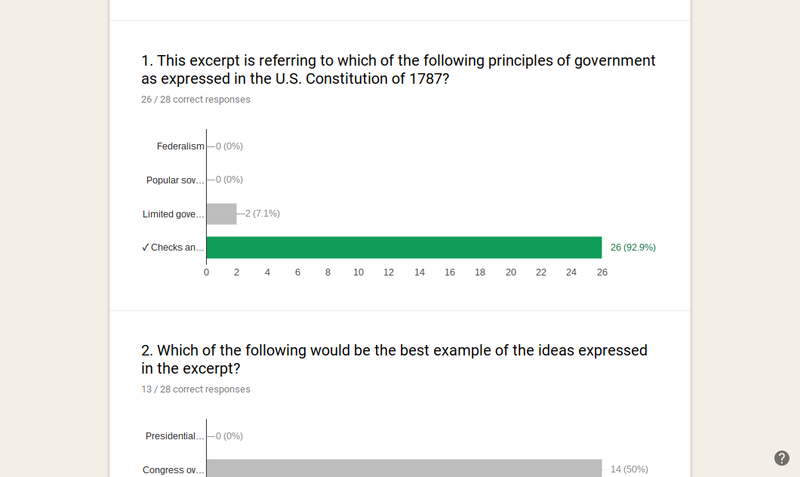 Students can submit a longer response, and we can project the responses on the front screen for discussion. Poll Everywhere has some fancy tools. My new favorite is the up / down response tool. 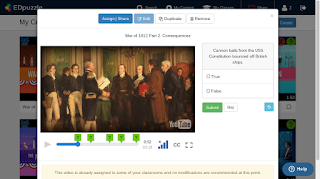 Students can submit a summary statement (or anything short) and they can vote up the better work and vote down the work that doesn't necessarily meet the standards. Think about all of the thought processes involved in a tool like this one. It's powerful, for sure. Verso App is my go to for argumentative discussion practice. It's claim to fame is the way it provides user identities to the teacher but makes them anonymous to the users. Students are more likely to take chances with both responses and comments. It also has like and flag tools, which allows students to identify the helpful work as well as the work that does not meet the standard or simply aims to disrupt. Google Classroom questions are great for when students need to submit work for marks and feedback. Sure, you might be thinking that Google Forms should suffice. The problem with forms is that it's too much work to separate the range for an individual student into a tab and send the tab to a sheet so students can see their feedback and score when it's entered. Did I lose you? In other words, Google Classroom lets me return the work to my students once the marks and feedback are ready. This can be done with forms, but it's a long process with tedious details that classroom teachers don't have time for. Google Forms. Plickers. Mentimeter. Poll Everywhere. Zipgrade. Try all of these. They all do something different and could help you support a variety of strategies. But be patient. Updates from a variety of directions can bring new successes just as well as new challenges. Google Forms, for example, recently added quiz and auto-grading options, so I don't have a huge need for some of the other tools like Plickers or Zipgrade. I particularly like how I can insert a primary source document as an image and ask a variety of question types. Take the matrix, for example. Teachers could assess for identification of fact or opinion statements by listing a series of statements in the rows and using the columns for fact and opinion options. Try the same for cause and effect. You see? We're not integrating technology to teach kids how to use Google Forms. We're assessing their ability to identify fact from opinion, and we're [they're] getting the results right away. When I want to give a paper-based assessment, Zipgrade is the best. I can print the answer sheets and use my phone to grade. The results are itemized and graphed for quick analysis. Again, I'm not using fancy tools to write blog posts. I write blog posts because it would be a crime to not share the facility I experience through the strategic use of tools like Zipgrade to immediately inform how and what I will teach next. As I mentioned earlier, Poll Everywhere integrates with Google Slides. Every few slides, I like to add a question to check for understanding. The kids like it, and it breaks up the lessons, especially during a sit and get activity. 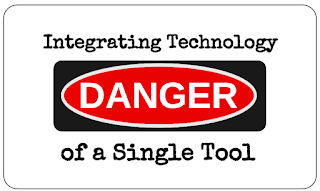 I try to limit my technology choices so that my students are not distracted by the variety of tools. 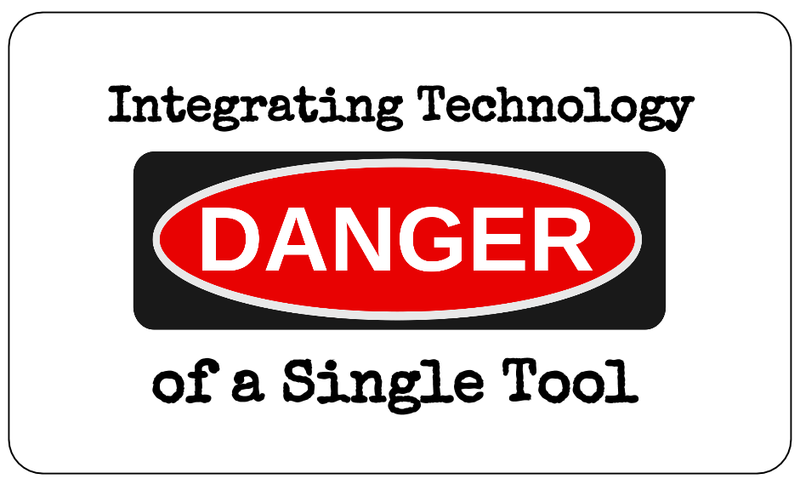 This got me thinking about whether it would be a good idea for a school to endorse one tool over another – if it would be beneficial for the students to not have to learn so many different tools. My conclusion is simple. Kids need to learn a variety of tools and web applications so they can become more digitally literate. Over time, they will begin to view different sites and tools in terms of the functions of the different parts as opposed to the branding of a particular piece of technology. They won't suffer the danger of a single tool. When teachers ask me for help with a Google App and I see that they are not using Chrome, I start to feel bad for how much they are missing. Some have told me that their technology support has told them not to use Chrome – that it's slow. I admit that Chrome has several user settings that need to be addressed before enjoying the facility. But I assure non-Chrome users that once they commit to a browser that can be customized, they will never go back to they way they once worked. My favorite customization is using extensions, which are tools that can be added to a browser. 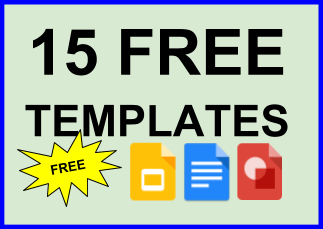 These tools range from link shortening to more complex tools that allow you to do screencasts or make GIFFs. Chrome extensions can make a teacher's work, especially in a 1:1 environment, rather effortless when it comes to basic routines or packaging the materials for learning. Need a QR code generator or a webclipper? 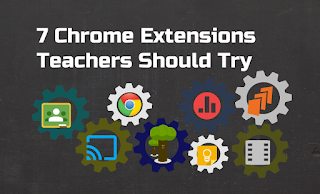 Chrome extensions for those needs and many more are available in the Chrome Store. Here are five of my most-used extensions. I wouldn't want to teach without them. The Classroom extension does three important functions. (1) Share to Classroom; (2) Push to Students; (3) Push to Teacher. Let's say you've found a webpage that you want your students to access for an assignment. While on the page, click the extension and share the page to Classroom. It's that easy. Pushing pages is great. It's like passing be out papers to every student at once with a couple clicks. I especially like pushing pages when something unplanned comes up during instruction. Explore the teachable moment by pushing the resource right away. Casting a screen is different than pushing a page. When a student's screen (or browser tab) is cast to a teacher's, the student can still control what's displayed on the teacher's screen. The teacher display is best operated via the Google Cast for Education App. Once installed, this app can sync the student accounts in the Google Classroom rosters. Students click the extension, choose the device, and await approval. It's a great way to facilitate student presentations. Google cast also works with apps like Airserver. The downside is that Airserver doesn't require permission to cast, which is why I prefer Google Cast for Education. This is my new favorite tool – mostly because it's a major time saver. 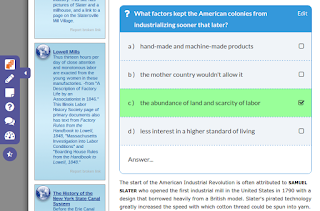 The DecentEdu extension allows users to add questions to webpages or published Google Docs. Multiple-choice questions are scored automatically, and all questions are collected and accessible on the teacher's DocentEdu dashboard. Here's a recent post about DocentEdu. Try it. You'll love it. Want to add questions to a slide presentation? The Poll Everywhere extension allows you to add questions from your Poll Everywhere account without leaving Google Slides. Check out this post for more about this app smash. Sometimes the easiest way to explain something is to show it with a video. Students like videos because they can pause and rewind. It's harder to do that with a teacher explaining something to a class full of peers. Screencastify saves videos to a folder in Goigle Drive and is easy to set up and start recording. I still like using Snaggit for GIFFs and other clippings from the Web, but when it comes to video, I haven't found an easier approach than Screencastify. Websites are great for teaching, but sometimes I don't want my students to be distracted by ads or other features on the site. That's why I use Print Friendly and PDF. It's easy to use and takes away all the clutter. My ELLs and students with learning differences especially benefit from the simplified formatting. With all of our lives happening so much more in the virtual world, it's easy to lose sight, literally, of what's important. Don't lose it, keep it with Google Keep. To me, it's more than a note-taker. Keep reminders allow me to work important routines into my days, weeks, and months. Plus, the ability to color code, add images, and tag notes for easy filing are lifesavers. The Keep extension allows you to save a webpage and add a tag to stay organized. The best part is that you don't have to leave the page. Keep it, and proceed with your work. Do you have a favorite extension? Share with us in the comments. I'm not a football fan, but I like the game. I'll watch football with certain people, and I will certainly enjoy watching my home team, the New England Patriots. But I don't seek information on players or other teams, even though I enjoy hearing football fans talk about it. I respect the hard work and strategy involved. 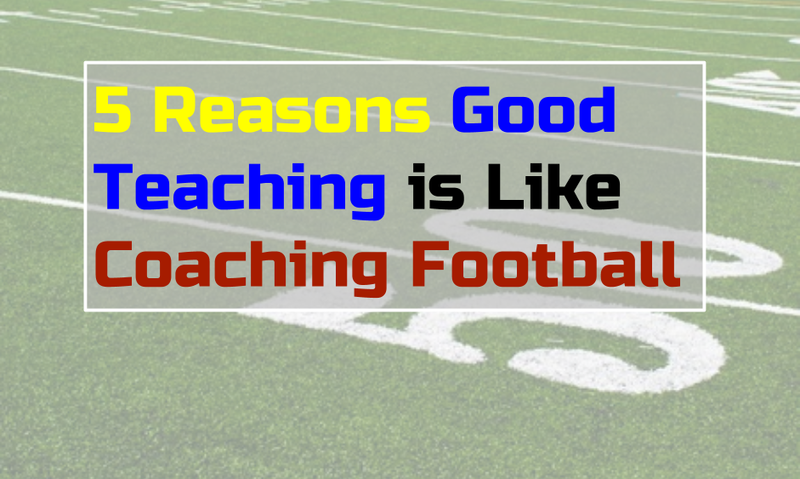 Teachers can learn a lot from successful team sports coaches or performing arts directors – the way they break the whole game or production into manageable chunks to master. More importantly, effective coaches focus on helping players understand and access their "inner game" (see Inner Game of Tennis). 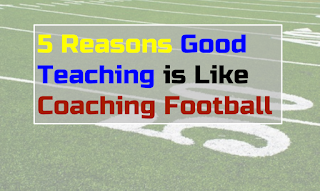 I've been thinking about these ideas for many years, but it was the following Tweet from Brad Currie and the recent MassCUE16 conference at Gillette stadium that inspired this post. Here's what I came up with to develop this idea. Football coaches study film to identify tendencies and tricks that worked. They use this information to make drills and prepare for games. My band directors did a very similar thing during each performance. They would make notes and discuss the rehearsal agendas for the coming week. When issues persisted, they implemented rewrites to the music or adjusted the regular warmups to isolate the issue and dedicate time to specific improvement. Teachers call this formative assessment. It comes in different shapes and sizes and can be the work that makes the difference. Whether its to increase speed, agility, or learn the playbook, football teams don't play the whole game in practice. It's not necessary to write a five-paragraph essay for every assignment if the goal is to write five-paragraph essays. The skills have been targeted, so it's time to run drills. One-sentence summaries are powerful ways to check for understanding before students walk out the door. It allows them to focus on one sentence, not taking a single word or phrase for granted. Like a football game becomes a series of plays that win the game, essays are a series of sentences that convey an argument. Coaches are constantly yelling at players. Okay, they're yelling because of the crowd noise, but they are giving them encouragement to keep giving it their all. Great coaches give players specific praise about what they are doing in the moment and how the team needs more of it. In these moments, the expectations are often clear. This establishes the conditions in which people can thrive. The conversation over praise vs. encouragement takes me back to Carol Dweck's work from before she wrote Mindset (2006). Dweck cautioned praising students without being specific. She said the labels, such as "smart" or "gifted," are damaging if they are not connected to specific moments and achievements (1999). In other words, good teachers don't hand out gold stars. They provide actionable feedback pointing to the strengths and weaknesses of the work. Most importantly, they provide support, not answers. Good teachers are the "guide on the side," not the "sage on the stage," as Alison King puts it (1993). Players need to have the confidence to make decisions. This cannot happen if they are always worried about what the coach will think. The feedback or correction from the coach is important, but it should be a positive impact on the player and the game. I can still here my music teacher say, "If you're going to make a mistake, make it big." The logic behind this expectation was to ensure that we are always confident. Plus, it's easier to make a correction when it's obvious. Teaching should be the same way. I don't want my students hiding behind anxiety-laden smiles. I want them to fall hard (not literally) and get up so we can talk about what happened before trying again. That's learning. It's messy. It's playful. It's natural. It's not supposed to be about grades and worry of failure. Great teams persist and improve regardless of the score, and it takes a strong coach to ensure that persistence and effort are a part of the culture. The best lessons are often not learned from our successes. This is all contingent upon how we reflect on the losing performance and what we do with it moving forward. Are the reflections honest? Are they specific? Do they inform our agendas? Can we prioritize the issues? These are all questions that successful people use to set goals (see SMART goals).